The cattle herd at Burwash is a Suckler herd - this means that the cows (who live for about 10 years) are kept for the calves that they rear - these are in turn fattened for their meat. Most of our cows are pedigree Beef Shorthorns, as is the bull. Most of the time they are out in the fields, but when it gets very cold we have an enormous barn that they stay in. Our cows are very well fed; they eat clover rich grass mixtures throughout their lives, in the summer they graze it lovely and fresh; what's left is conserved as silage for them to eat through the winter. Because of this clover rich diet, the Omega 3 levels (needed for all kinds of things in your body - but especially good for your brain!) 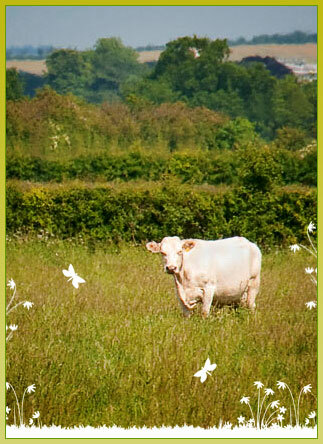 in the meat from organic cattle is greatly enhanced. We never graze them on the same field 2 years in a row and this break interrupts the life cycles of pests and diseases - another way for our organic farm to avoid using chemicals. Normally our cows have one calf a year, although occasionally they have twins. This is about the only time they might need our help - apart from feeding in winter, they need very little attention. The cattle are weaned (this means they stop having their mothers milk) at about 6 months and are ready to eat by the time they are about 2 years old.